The Atmel ATTINY104-XNANO Xplained Nano evaluation kit is a hardware platform for evaluating ATtiny102/ATtiny104 microcontrollers. 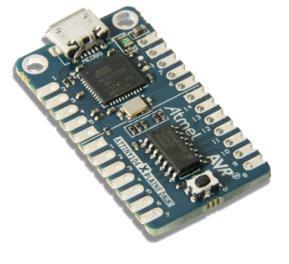 Supported by the Atmel Studio free integrated development platform, the kit provides easy access to all device I/O, one button, and one LED. The Xplained Nano evaluation kit includes an on-board programmer, and no external tools are necessary to program the ATtiny104 host MCU that drives the board. The onboard programmer can be completely disconnected from the host MCU or it can be used to program any other MCU with the Tiny Programming Interface (TPI).